Forest management practices that manipulate forest structure have significant impacts, both positive and negative, on wildlife populations and largely determine the presence, abundance, and productivity of various wildlife species on a given site. Growing public concern over the effects of forest fragmentation on biodiversity has led to substantial changes in the way forest management is conducted. For example, the reduction in clear-cutting on public lands is attributable to protests based primarily on such concerns. It is therefore desirable to devise silvicultural systems and landscape structures that have minimal negative impacts on wildlife yet allow for commercially viable and sustainable forest management. The overall goal of wildlife research at the Center is to assess the effects of forest management practices on wildlife population dynamics and behavior, and, ultimately, to use this information to model wildlife habitat relationships in managed landscapes. The Center is currently involved in several projects investigating wildlife habitat relationships in the South Carolina Coastal Plain. Funded by a USDA National Research Initiative grant, this study is being conducted on the Savannah River Site and is a cooperative effort between the University of Georgia, North Carolina State University, and two SRS labs (CFWR and Insects and Diseases of Southern Forests, Athens, GA). The study employs an experimental approach to first identify the patterns of avian use of experimental group selection harvest gaps and then determine the processes driving those patterns, focusing on variations in arthropod abundance in time and spaces as a proximate cause. The study will provide information on optimal sizes of harvest Sampling in the forest adjacent to each gap will provide information on forest-dwelling species that may not use gaps at all. Finally, the study will provide a greater understanding of why birds use harvested areas as they do, and will thereby enhance our knowledge of the impacts of bottomland forest management on birds. Kilgo, John C.; Miller, Karl V.; Smith, Winston P. 1999. Effects of Group-selection Timber Harvest in Bottomland Hardwoods on Fall Migrant Birds. Kilgo, John C. 2005. Harvest-related Edge Effects on Prey Availability and Foraging of Hooded Warblers in a Bottomland Hardwood Forest. Champlin, Tracey B.; Kilgo, John C.; Moorman, Christopher E. 2009. Food Abundance Does Not Determine Bird Use of Early-Successional Habitat. Another cooperative project at SRS involving the Center, SRI, CU, SREL, and UGA is investigating the effects of various levels of coarse woody debris on the ecology of loblolly pine stands. Phase I employ three treatments (a control, removal of downed coarse woody debris and removal of standing and downed coarse woody debris), replicated in a randomized complete block design. Phase II will employ two additional treatments intended to represent catastrophic pulses of coarse woody debris, one of downed and one of standing wood. 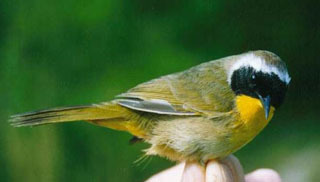 The study will provide information on the effect of removal of coarse woody debris on avian species richness and abundance, as well as information on the interactions between availability, size, and location of coarse woody debris and the spatial arrangement, size, and density of bird territories. Kilgo, John ; Vukovich, Mark. 2014. Can snag creation benefit a primary cavity nester: response to an experimental pulse in snag abundance. Zarnoch, Stanley; Vukovich, Mark A.; Kilgo, John C.; Blake, John I. 2013. Snag characteristics and dynamics following natural and artificially induced mortality in a managed loblolly pine forest. Kilgo, John C.; Vukovich, Mark. 2012. 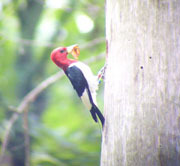 Factors affecting breeding season survival of red-headed woodpeckers in South Carolina. Davis, Justin C.; Castleberry, Steven B.; Kilgo, John C. 2010. Influence of coarse woody debris on herpetofaunal communities in upland pine stands of the southeastern Coastal Plain. Moseley, Kurtis R.; Owens, Audrey K.; Castleberry, Steven B.; Ford, W.Mark; Kilgo, John C.; McCay, Timothy S. 2009. Soricid Response to Coarse Woody Debris Manipulations in Coastal Plain Loblolly Pine Forests. Lohr, Steven M.; Gauthreaux, Sidney A.; Kilgo, John C. 2002. Importance of Coarse Woody Debris to Avian Communities in Loblolly Pine Forests. Isolated wetlands provide important breeding habitat for many forest birds and serve as important foraging habitat for many wading birds. They also are important to aerial foraging species, both birds and bats. 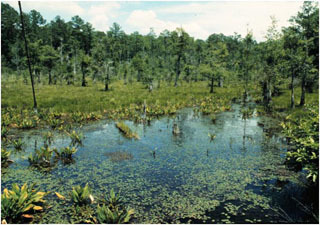 As part of the Center's research on Carolina bay restoration at the Savannah River Site, Center scientist, in collaboration with West Virginia University, the University of Tennessee, and the USFS Northeast Research Station's Ferno lab, are assessing the response of both bird and bat communities to various management alternatives. Menzel, Jennifer M.; Menzel, Michael A.; Kilgo, John C.; Ford, W. Mark; Edwards, John W. 2005. Bat Response To Carolina Bays and Wetland Restoration in the Southeastern U.S. Coastal Plain. Czapka, Stephen; Kilgo, John. 2011. Importance of Carolina Bays to the Avifauna of Pinelands in the Southeastern United States. The coyote was historically a species of the North American plains. Since European settlement, coyotes have expanded to cover virtually the entire continent, with occupation of much of the Southeast having only occurred in the past few decades. Although their status as a non-native invasive species in the region is debatable, they had been absent from southern forests for millennia and may never have existed here in their present form. As a large carnivore with a very broad omnivorous diet and great behavioral plasticity, coyotes represent an ecological force in the region that should be better understood. For example, one of the greatest influences coyotes may exert on Southeastern ecosystems is through predation on deer fawns. This research aims to better understand the abundance, population dynamics, and genetic structure of coyotes in South Carolina, as well as the magnitude of coyote predation on deer fawns and the potential for this predation to affect deer population size. Chitwood, M. Colter; Lashley, Marcus A.; Kilgo, John C.; Pollock, Kenneth H.; Moorman, Christopher E.; DePerno, Christopher S. 2015. 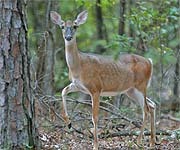 Do biological and bedsite characteristics influence survival of neonatal white-tailed deer? Chitwood, Michael C.; Lashley, Marcus A.; Kilgo, John C.; Moorman, Christopher E.; Deperno, Christopher S. 2015. White-tailed deer population dynamics and adult female survival in the presence of a novel predator. Kilgo, John C.; Vukovich, Mark; Ray, H. Scott; Shaw, Christopher E.; Ruth, Charles. 2014. Coyote removal, understory cover, and survival of white-tailed deer neonates. Kilgo, John C.; Ray, H. Scott; Vukovich, Mark; Goode, Matthew J.; Ruth, Charles. 2012. Predation by coyotes on white-tailed deer neonates in South Carolina. Kilgo, John C.; Ray, H. Scott; Ruth, Charles; Miller, Karl V. 2009. Can coyotes affect deer populations in southeastern North America? Kilgo, John C. 2009. Coyotes in the east: are they impacting deer? Miller, Debra Lee; Schrecengost, Joshua; Merrill, Anita; Kilgo, John; Ray, H. Scott; Miller, Karl V.; Baldwin, Charles A. 2009. Hematology, Parasitology, and Serology of Free Ranging Coyotes (Canis latreans) from South Carolina. Journal of Wildlife Diseases. Schrecengost, Joshua D.; Kilgo, John C.; Mallard, David; Ray, H. Scott; Miller, Karl V. 2008. 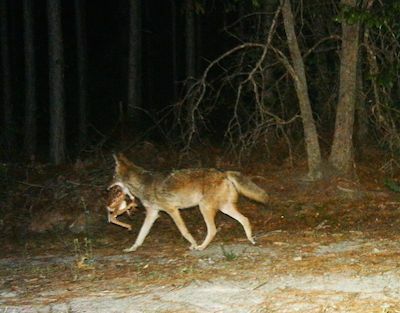 Seasonal food habits of the coyote in the South Carolina coastal plain.